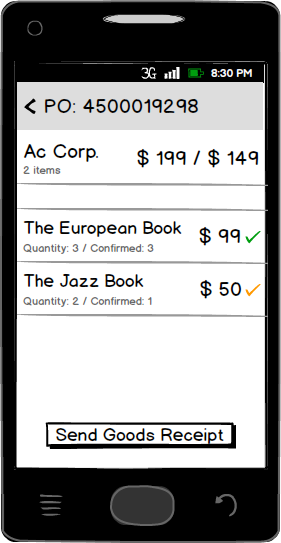 In our previous post we have introduced our project idea about creating SAP MM on Mobile with Xamarin platform. 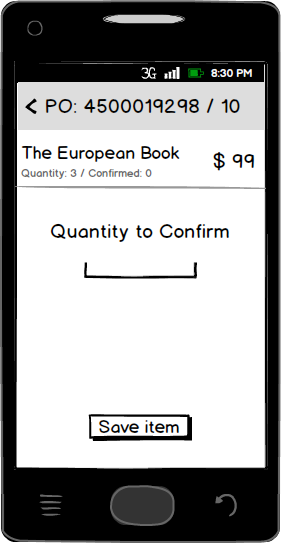 In this post we go a little bit deeper and analyze the process of the Goods Receipt and create a mobile wireframe for supporting this process. Let's see how a simple Goods Receipt works based on a Purchase Order. We associated a mobile screen for each step and we created a wireframe that shows our idea how we would like to help the work of the colleagues in the warehouse. If we want to work with an app that connects to SAP then we want to secure our data. 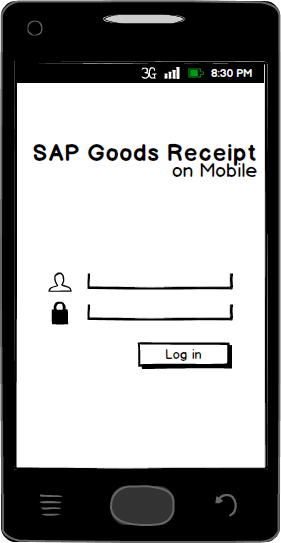 The most obvious part of the mobile security that we authenticate to SAP with our SAP user and password. If a vendor arrives with the delivery to the warehouse, we need to find the Open Purchase Order for the Vendor that we have expected for today. 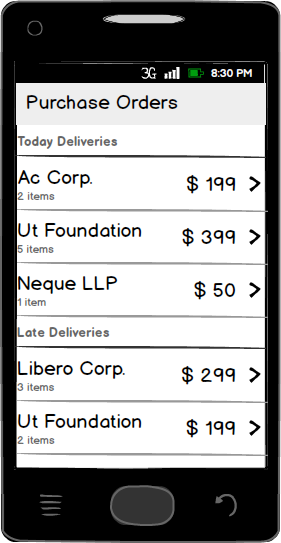 We need a list of the current purchase orders that we can easily associate with the vendor. After finding the appropriate purchase order we can check it's details. Our task is to check and confirm the quantities of the materials on each line item. We need a simple list of items that we can confirm. We want to enter into each line item and close them. The screen below shows a state where we have already checked and confirmed the items, so they are closed. We want to use green color for showing that the confirmed quantity is the same as the quantity on the purchase order and we want to use yellow color if the confirmed quantity is different. The main reason of the Goods Receipt's process that we want to check the quantities of the delivered items and confirm the Purchase Order. We want to register the actual received quantities from the Vendor and to close the confirmation process for the current line item. After we checked each item and saved the confirmed quantities for them, we can close the process by sending the Goods Receipt Document that we have created based on the open Purchase Order. The screenshot shows the final state: the purchase order is deleted from the list and we receive a message from SAP about the successful creation of the Goods Receipt. 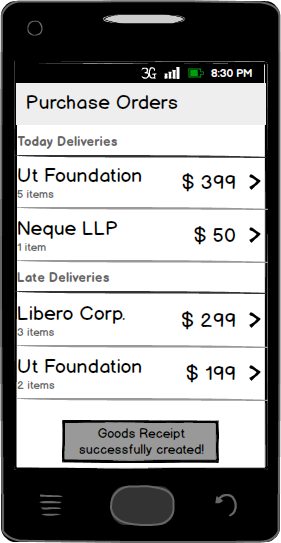 In this post we went through the Goods Receipt process analysis and we created a wireframe. All of the screen elements have a role. During our analyses we made choices what is important for the process and what is not important. The screens resonate with our intent how we want to support it and what are the crucial pieces of information we need for an efficient Goods Receipt. In the coming post we are going to work on our development based on the prepared wireframe starting with Xamarin Studio. Stay tuned! Information Technology is constantly changing and evolving. In this rapid world of change, we can not afford to be idle, and wait for miracles. We must learn and be up-to-date in Information Technologies, and we must keep up-to-date our IT infrastructures as well. What we find effective and modern today, can be obsolete tomorrow, which may lead to miss future opportunities! For example in the early days, "Warehouse Management" happened in simple checked notebooks, after the Industrial Revolution, storekeepers used check out systems with punch cards to keep up the pace with their competitors, followed by, they started using bar-coding and inventory management systems to make their tasks easier, precise and efficient, today, we use modern ERP systems to automatize and integrate everything with everything, besides this we use RFID to keep track and find our goods in our warehouses. To keep up the pace with you competitors, you must move forward and break away from your computers. If you like it or not, mobile apps are integral part of business by now. Today, many companies already use business apps in Field Service, Human Resource, Inventory, IT, and Customer Relationship Management. Using business mobile apps, we are able to make our processes more transparent, and get real-time feedback from our colleagues that accelerates and improves our processes, and eliminates human errors. If you are interested in this adventure, there is nothing to do, than to subscribe to our newsletter and follow our guides regularly on every weeks.